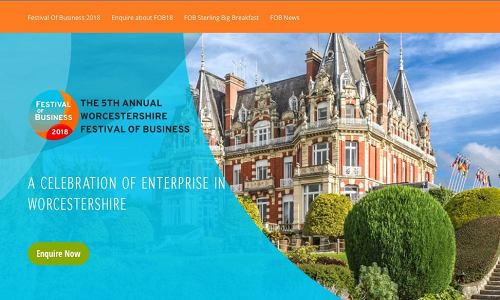 The Annual Worcestershire Festival of Business returns for its 5th year on Friday 14th September 2018. Following two hugely successful years based at Worcester Guildhall and Worcester High Street the event is moving venue to the iconic Chateau Impney Hotel in Droitwich. The exhibition will take place in the Regent Centre adjacent to the main hotel and has the capacity for two hundred plus exhibitors. With the location ideally placed for M5 access the organisers are hoping to attract visitors from both North and South of the region. Last year visitors attended from as far afield as Manchester and London. Stuart added “With free access and free parking, the Worcestershire Festival of Business is the one exhibition you really must not miss. We have some great exhibitors already confirmed from right across the business spectrum. From manufacturing to retail and everything else in between. In addition to the main exhibition event there is a breakfast networking event and a series of workshops and networking opportunities throughout the day. The event is organised by Worcestershire Enterprise Ltd, the business behind the #WorcestershireHour™ hashtag on Twitter. It will raise money for its official charity Midlands Air Ambulance and profits will also help support other local charities and events.